I went on vacation at the end of October/beginning of November, and I spent part of the time at my parent’s condo on Dauphin Island, a barrier island in Mobile Bay. 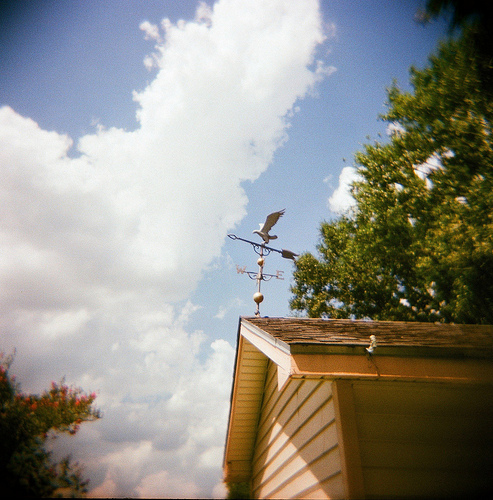 I had with me a shiny new Holga; I had a Holga before, but for some stupid reason decided I didn’t need a Holga and a Diana, and since the Diana was literally the first lo-fi camera I bought since re-discovering film, I felt loyal to it. 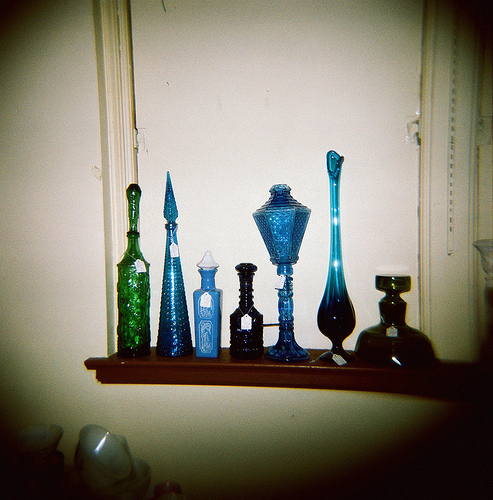 Well, that was the wrong decision–not to keep the Diana, but to sell the Holga. And then they quit making Holgas, and I felt like that was probably that. Except nothing is ever that in the analogue film community, and of course another plastics factory bought the molds and started cranking them out barely a year later. Anyway, this may look familiar to you if you’re a Tim Burton fan, it’s the abandoned “Town of Spectre” movie sets from Big Fish. 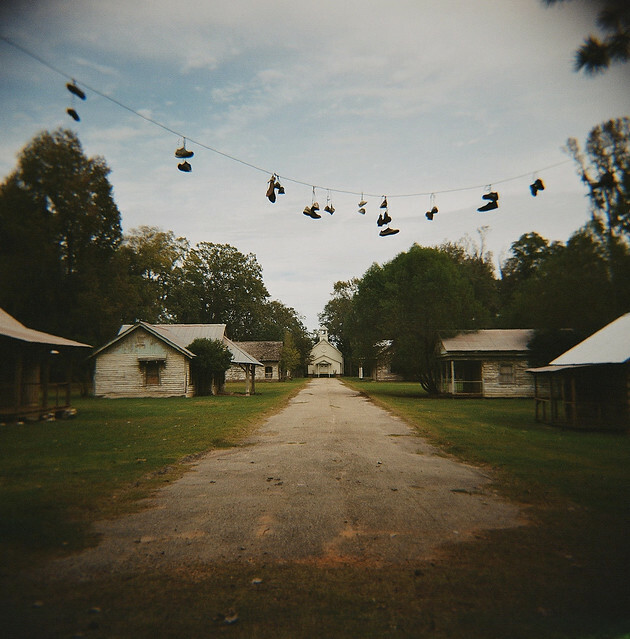 They were built on Jackson Lake Island near Montgomery, AL, and because it’s privately owned land, the owner just left them. You can get onto the island for a $3 ($10 for overnight camping) fee. The tree is fake, too–it’s made of styrofoam, and you can see where the brown paint has rubbed off. This is my first time ordering large prints from medium format negatives; the square prints are both 10×10. 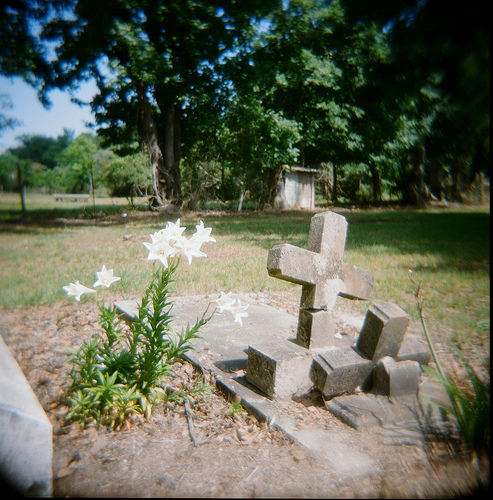 The one in the cemetery was taken with my Holga on a spring early afternoon, and it’s printed on Kodak Lustre. It’s a little roadside cemetery in the country near the larger Bancker cemetery where my grandfather is buried. As you can see in the photo, there are cow pastures behind and to one side of it. The Spanish moss is always particularly beautiful on that large tree in the center. 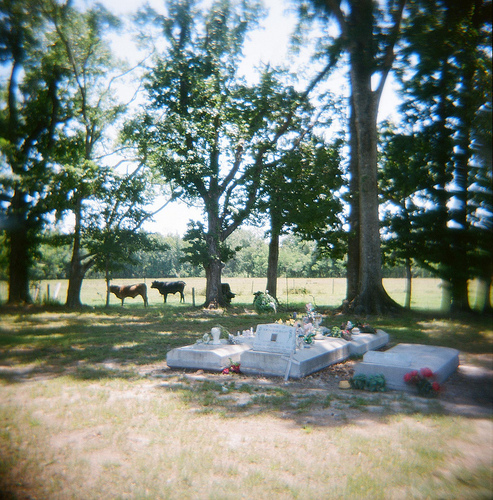 I love the dreaminess of the photo (that great Holga softeness and corner vignetting), the little pops of bright color from the artificial flowers, and the cows in the background, which look so odd near the stark white tombstones. 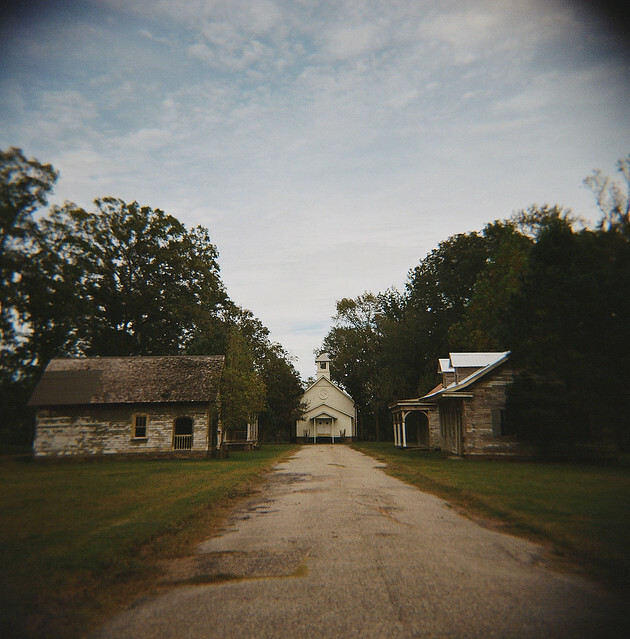 The other photo was taken at the Washington Schoolhouse Antiques Mall with my Kodak Brownie Hawkeye with a flipped lens, and it’s printed on Kodak Metallic. (They’re always putting different stuff in that old sink.) This is the first time I’ve had anything done on metallic that had light, soft colors. I decided to go with metallic because the pinwheel was made of glittery plastic, and I wanted to reproduce that look, but I also like the way it looks with more subtle colors, too. 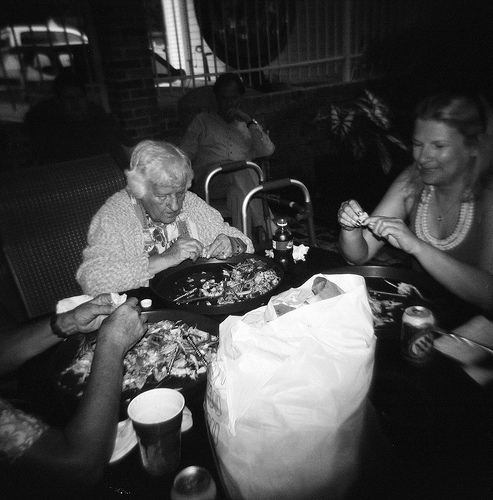 And the last photo was taken at the Audobon Aquarium of the Americas last summer in New Orleans, with my Lomo LC-A+. It’s an 8×10 and it’s printed on Kodak Lustre. (I don’t think I’ve had anything printed on matte, yet.) This is one of my favorite photos, I just think it’s so interesting to look at. Do you think the orange fish is leading the other fish, or being chased by them? 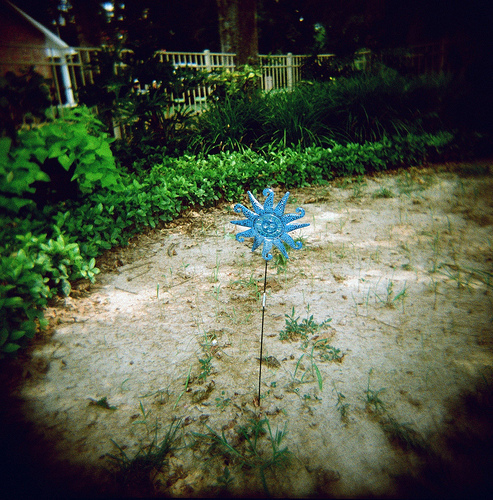 I haven’t used my Holga in months and had nearly forgotten that it takes insanely beautiful photos. These have not been edited at all. One of the rolls (#1-#12) was shot on the bulb setting, so they’re more softly focused than usual. I’m pretty sure both rolls were Kodak Portra 400VC. This is a tiny cemetery I found when looking for Bancker Cemetery, where my grandfather is buried. It’s almost certainly a private cemetery used only by one, maybe two, families. There are a lot of those around here; there’s one in Henry where a bunch of my great-grandfather’s brothers are buried, along with members of the Henry family. 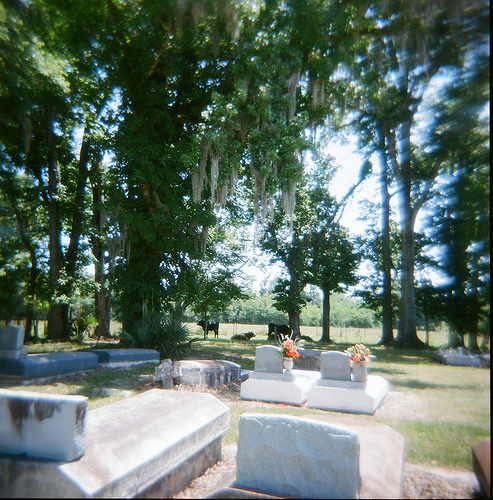 I call it “Cow Cemetery” (in French, because why not) for obvious reasons. I’m really going to try to not take this long in developing the 120 rolls I shot over Christmas. I’m sending the 35mm from the Golden Half today, and I will send the rolls from the Diana F+ as soon as I finish the roll in the camera, which I am trying to do today. This is at the ‘rents old house, which hasn’t been fixed or sold yet. We went there one day to dump some crab shells into the lake. Mom claims they get eaten by turtles. You definitely don’t want to put them in your trash unless the very next day is Trash Day, because WOW. That’s a powerful odor. This was the view from their backyard. While it’s pretty, you can kind of see why they had catastrophic flooding and storm surge twice in 3 years. August is crab season. I don’t really care for boiled crabs — while I love crab meat, I don’t find it worth the effort of breaking open those hard shells, digging out tiny shreds of meat, cutting your hands up and getting spicy boil into the cuts. I prefer getting dishes in restaurants that have the crab already extracted for you, like crabmeat au gratin or stuffed crabs. Crawfish is more my thing, because the effort is lower and the meat even tastier. 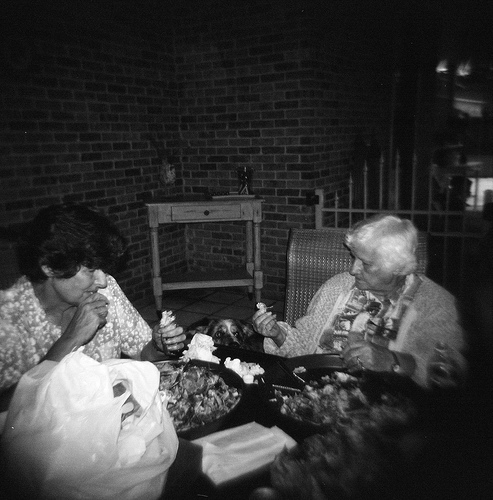 You can see Sheila lurking between Mom and Granny. She died a couple months later. Mom and Phil haven’t been without a dog since before leaving Fremont, the house felt really empty this trip. However, I think I’ll probably be with them when Mom decides it’s time for another one, which means: Puppy! Yay!! There hasn’t been a puppy in the house since Indy was a puppy more than 10 years ago. Snowshoe and Sheila were both acquired as adolescents. Nothing really amazing here. 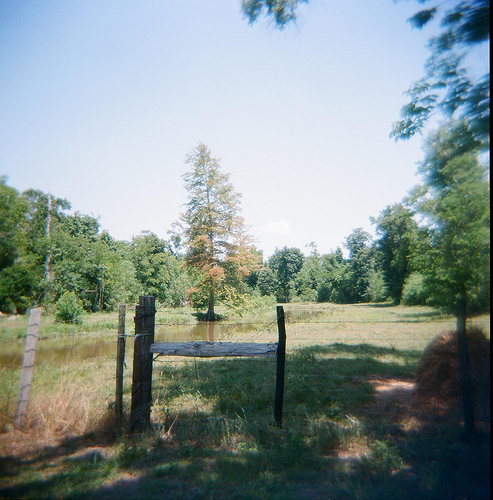 Basically I just wanted to see what a color roll looked like in the Holga, especially before I went on vacation. I kind of forgot about this roll actually, so it was a pleasant surprise to find it in the mail yesterday. 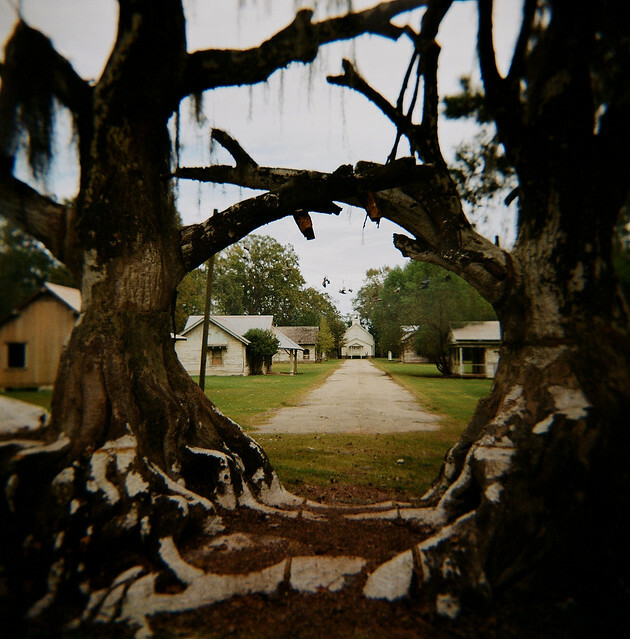 Holga Blog wrote a technical review of both the Holga and Diana, comparing the various specs. It’s pretty in-depth and I found it an interesting read. Ultimately he comes to the same conclusion I do: Why choose? Like me, he owns both. It’s hard to explain the differences between the two, especially since the flaws in such poorly-made cameras tend to vary widely. 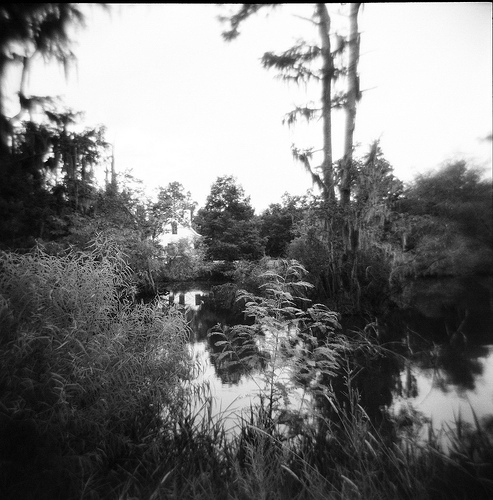 For myself, I find that the Diana (shooting medium format film) has more obvious vignetting, and the focus tends to be more uniformly off. 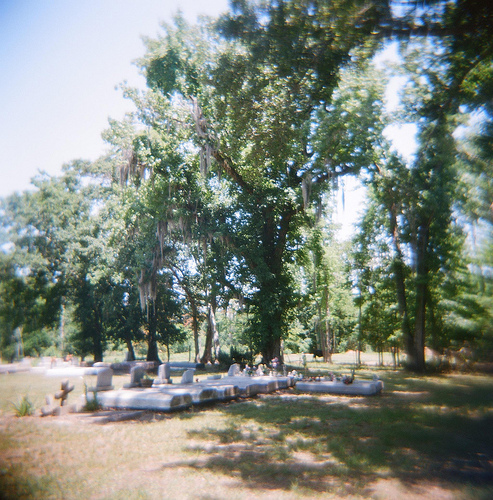 Sometimes photos taken with my Diana almost look like they were taken underwater. 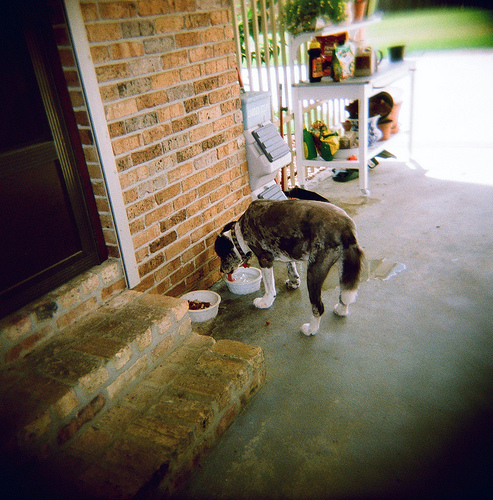 The Holga, on the other hand, has a really interesting center focus/blurred edge effect; as well as more light leakage (which can be considered either a plus or a minus; I would list it as the former). For me, it’s not about what the finished product looks like, anyway. They both shoot unpredictable and weirdly lovely photos. It’s more about what the shooting situation requires. I think of the Diana as a higher maintenance camera: The flash is not integrated, it’s almost as big as the camera itself*, color gels have to be manually inserted, the lens sticks out more, it’s a bright teal color. It’s more noticable, and it takes more time. I like to use it in situations where speed or conspicuousness is not an issue: in graveyards, or taking photos of buildings, say. Or any place where photo taking is expected and lots of other people will be doing it — next time I go to the Winchester Mystery House I am definitely taking my Diana. My Holga has an integrated flash with a color wheel (although not all models do), so there’s less set up for situations that require a flash. It’s also black and has a lens that sits more flush to the body of the camera, so it feels more inconspicuous. I like it for candid photos (especially of people I do not know); and photos inside of commercial or public locations, where you never know how people are going to react. 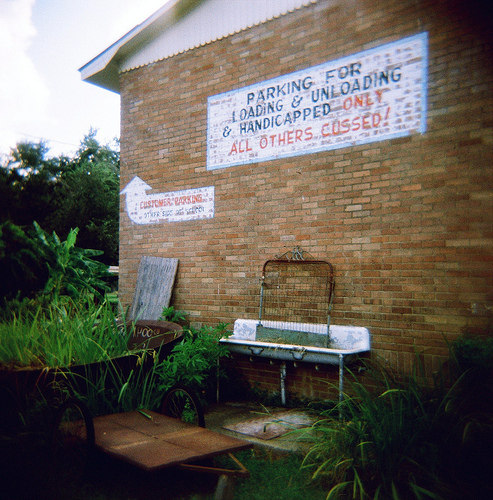 I had planned to take just my Holga to Louisiana, since I had the Diana at Christmas and shot a couple rolls with it. But I think I’ll have room for the Diana, and I didn’t have the flash last year (and it offers many more colors than the Holga color wheel — a dozen gels as opposed to just green, red, and yellow), so I may decide to bring her along, too. *You can use a hotshoe adaptor and use any conventional (and smaller) flash with the Diana. But I actually like the retro look and feel of the large Diana 2-pin flash.